Nurata, an oasis town in the Kysylkum desert in Uzbekistan, is located at the Silk Road, one of the most important historical trade routes between Europe and Asia. The town is known for the remains of the Alexander the Great Fortress, the holy Chashma source, the Chashma complex, also known as Nurata Shrine, and for its Suzani silk and wool embroideries. 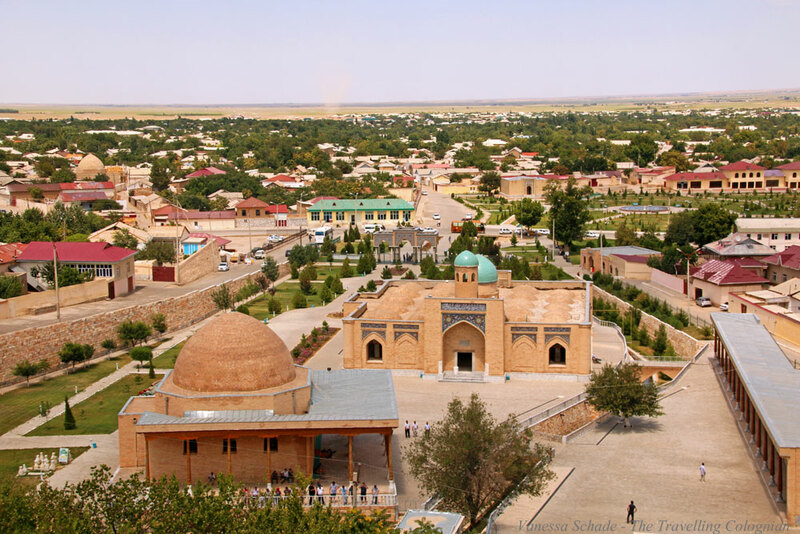 Nurata, which is also known as Nurota, is not part of the classic itinerary of a visitor of Uzbekistan, different than the main attractions Samarkand, Bukhara, Khiva and Tashkent. But those who are travelling to Aydarkul lake and stay overnight in one of the yurt camps in the desert will head to Nurata. I also visited Nurata as part of an adventure tour through Uzbekistan on my way from Samarkand to Aydarkul lake and to one of the yurt camps in the desert. Nurata is located on the ancient Silk Road, 230 kilometres northwest of Samarkand and 75 kilometres northeast of the city Navoiy in the middle of the Kysylkum desert. The town is situated nearby the Nuratau Mountains at a height of 490 metres above sea level. 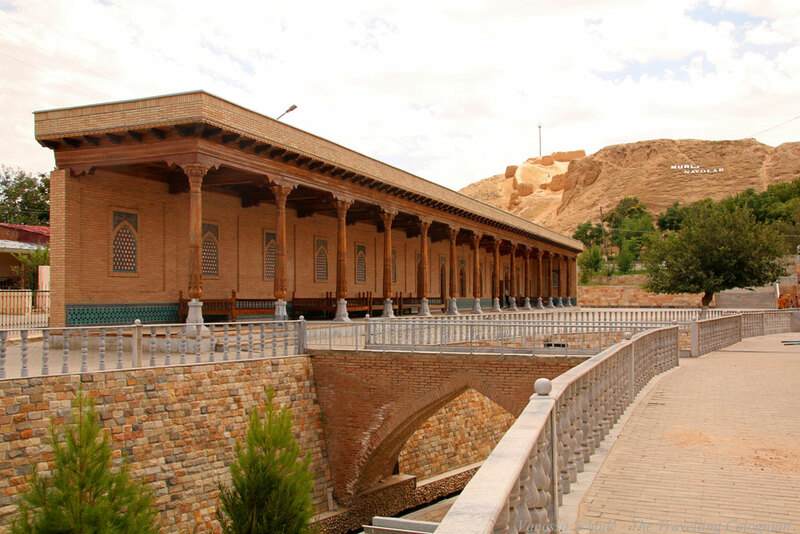 The main attractions of Nurata are the remains of the Alexander the Great Fortress and Chashma, a complex of religious constructions, which includes the Chashma spring, the Djuma Mosque and a bathhouse which is named Khamom. 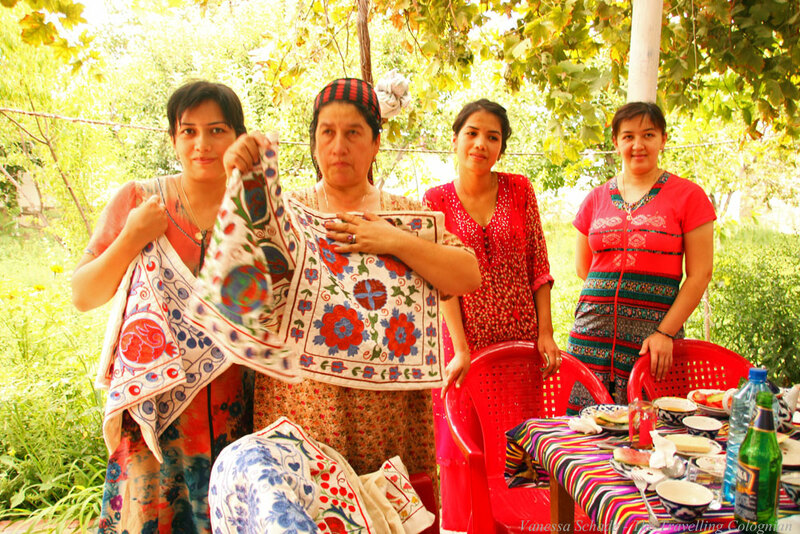 The town is also famous for its Suzanis, cotton fabrics which are decorated with wool or silk embroideries and are especially produced in Central Asia. Nurata was founded in 327 before Christ by Alexander the Great and was previously called Nur. The city has almost 31.000 inhabitants and is a popular destination for pilgrims who want to visit the holy Chashma source and the Chashma complex. 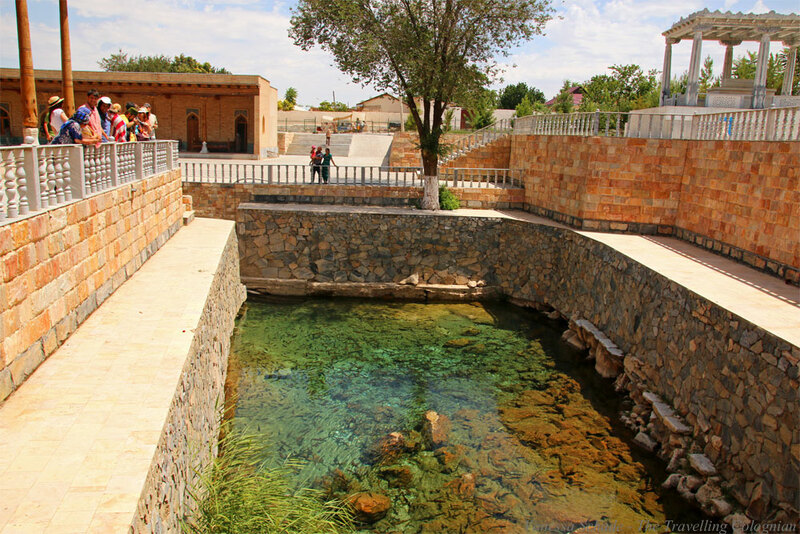 Alexander the Great also established Kariz, an underground water-pipeline system which connects the holy source of the spring water with several wells and places where it is needed. Kariz underground water-pipeline systems are widespread in many cities in Central Asia and Northwest China. The most famous Kariz underground water-pipeline system is located in Turpan in the northwestern Chinese province Xinjiang. The remains of the Alexander the Great fortress sit enthroned on a hill above the city. What must have been an impressive building in the time of the former ruler, are now only completely decayed ruins. It is difficult to imagine the dimensions of the former fortress. Nevertheless, the remains are among the most important archaeological monuments in the region. These shone in the morning light when we arrived in Nurata. The ascent to the fortress is not particularly challenging for an average trained person, but when we were there, the temperatures in Nurata were around 40 degrees Celsius. But on the summit, we were rewarded with a fantastic view over the city. The word Chashma is Tajik and means spring. 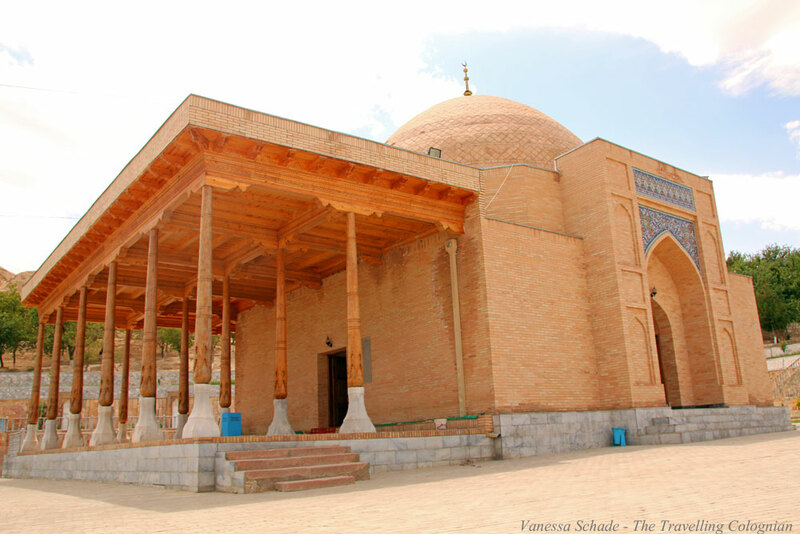 The Chashma Complex, also known as Nurata Shrine, consists of the source of the same name, the Djuma Mosque and a bathhouse which is also called Khamom. The complex is a key attraction for religious pilgrims of the region and even of the neighbouring countries. Southeast of the Chashma complex is a cemetery with tombs of several holy personalities. After our descent, we visited the Chashma source which is located at the foot of the remains of the Alexander the Great fortress. The source as well as the floating fishes in it are considered sacred and may not be killed. 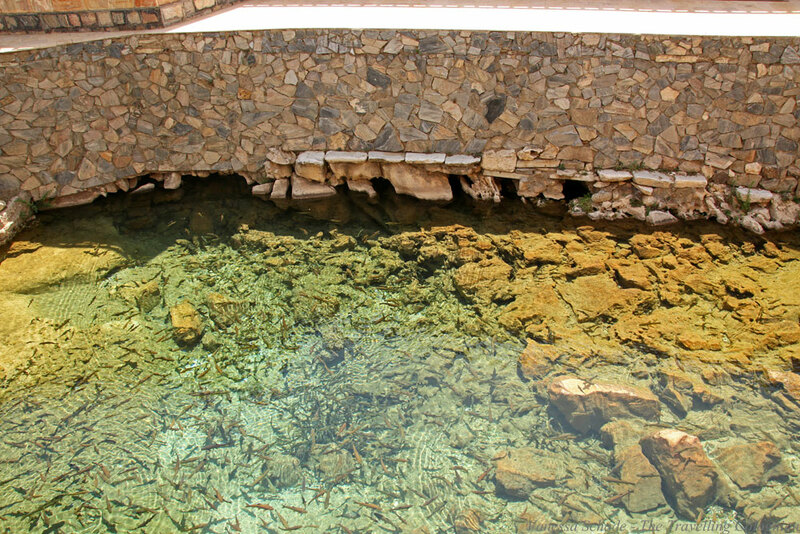 Our Uzbek tour guide Gulnoza threw herbs into the source which enticed the fishes to the surface. Feeding the fishes is considered a good deed. The Djuma Mosque which we only visited from the outside is located exactly opposite of the Chashma source. Remarkable is its giant turquoise coloured dome with a diameter of 16 metres. Moreover, it has 24 other domes and several elaborately decorated columns. We also saw the Khamom bathhouse only from the outside. 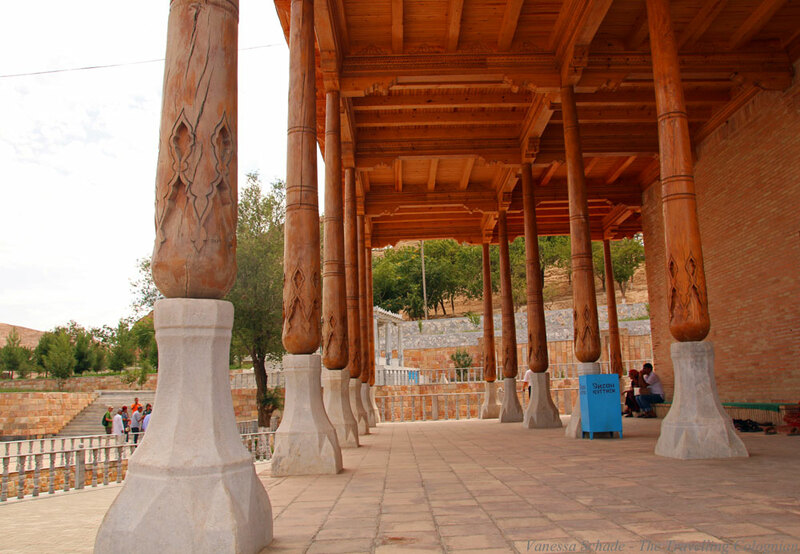 Like the Djuma Mosque, the Khamom bathhouse is supported by several ornately decorated columns. In front of the Khamom bathhouse, we met, just as on the way to the exit, several pilgrims who visited the Chashma complex. Nurata is famous for its Suzanis, large format cotton fabrics with silk and wool embroideries which are made in Uzbekistan, Tajikistan and other Central Asian countries. You will probably get them in shops in Nurata and in other destinations in Uzbekistan and Central Asia but since I didn’t go shopping on my Uzbekistan trip I can’t say this for sure. My group and I were offered cushion covers with Suzani wool embroideries in the restaurant Nur by a group of local females. I bought two cushion covers but I didn’t feel pushed to do so. The restaurant Nur is the only restaurant in Nurata but it is highly recommendable. Just behind the entrance, we were greeted by two friendly locals who were sitting around a flat table. There were more tables on the roofed terrace and in the courtyard. We sat down at a table under a leaf canopy. Before the main course which we ordered à la carte, we were served a selection of sweet and savoury starters. You can take a taxi (for about 3.50 US-Dollars) or a minibus (for about 2.50 US-Dollars) from Navoiy to Nurata. 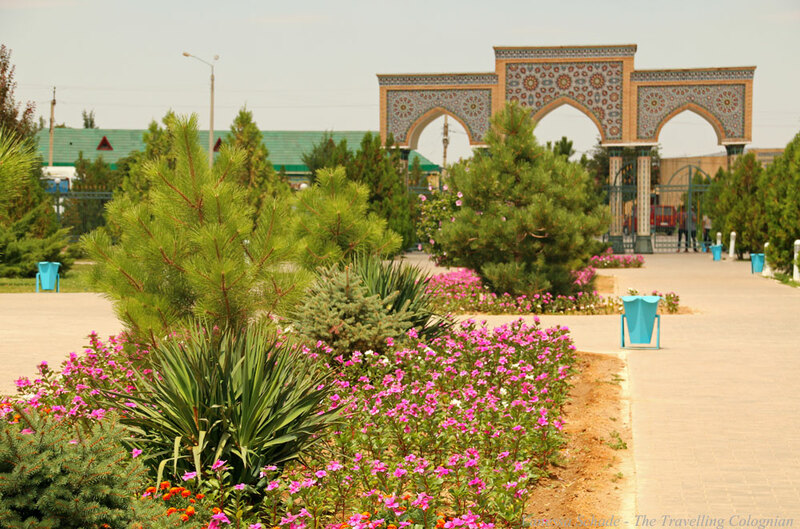 There is a direct train connection from Samarkand to Navoiy. Of course, you can also take a taxi from Samarkand to Nurata but I can’t tell you how much that costs. 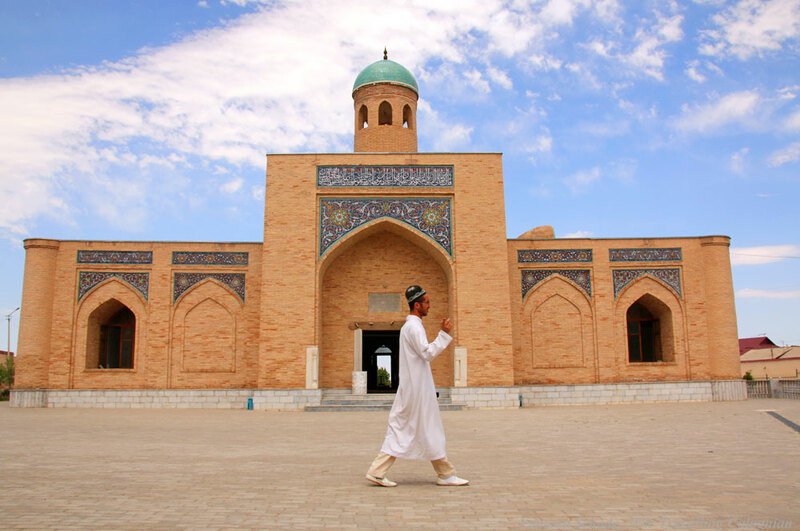 English is only partially spoken in Uzbekistan. You will easier get around when you speak Russian or even Uzbek. 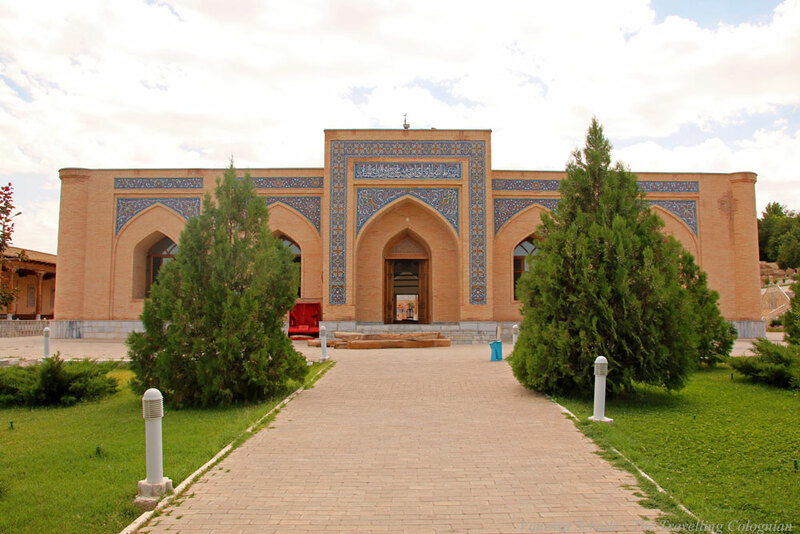 In case you think that the individual journey from Samarkand is too complicated, you can also visit Nurata as part of a tour. Probably, there are several travel agencies which offer trips to Nurata, to the Aydarkul lake including overnight stays in one of the yurt camps in the desert. 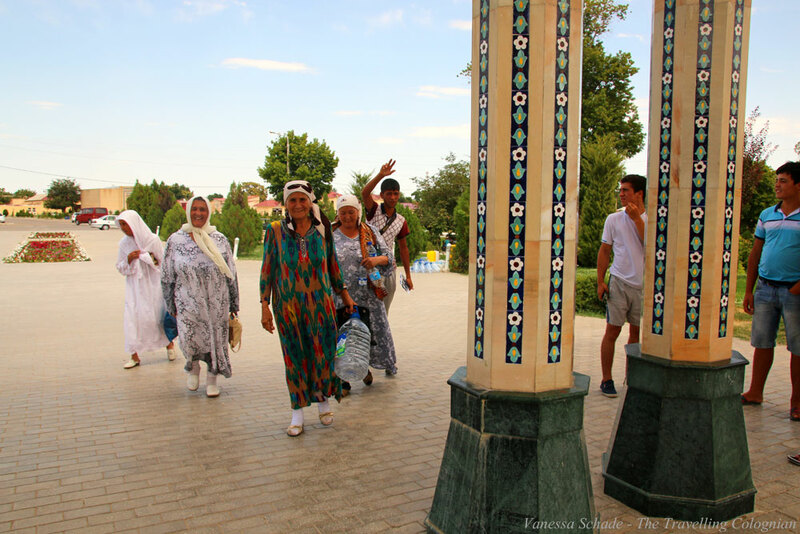 I travelled through Uzbekistan* with G Adventures*, a Canadian adventure travel company which offers small group tours. They also offer tours through Tajikistan*, Kazakhstan and Kyrgyzstan*, a tour through three Central Asian countries* and another tour through four of the Stans*. The best travel time for Nurata and Uzbekistan is from May to September, with July being particularly hot with temperatures between 35 and 40 degrees Celsius. In June and August, the temperatures are at 30 to 35 degrees. For most foreign visitors, the months of May and September with temperatures of 25 to 30 degrees Celsius are the most comfortable. 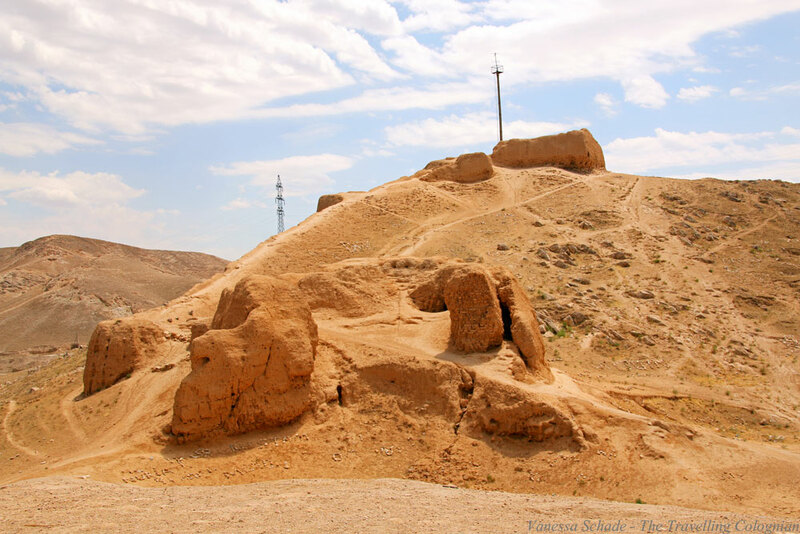 If you travel from Samarkand or Bukhara to Aydarkul lake and to one of the yurt camps in the Kysylkum desert, the oasis town of Nurata and the remains of the Alexander the Great fortress are definitely worth a visit. When you only have a limited amount of time in Uzbekistan, and Nurata and the Aydarkul lake are not on your itinerary anyway, I probably wouldn’t drive there, specifically. However, I would also recommend going to Nurata if you travel through Uzbekistan individually and spend more than one and a half or two weeks in the country. 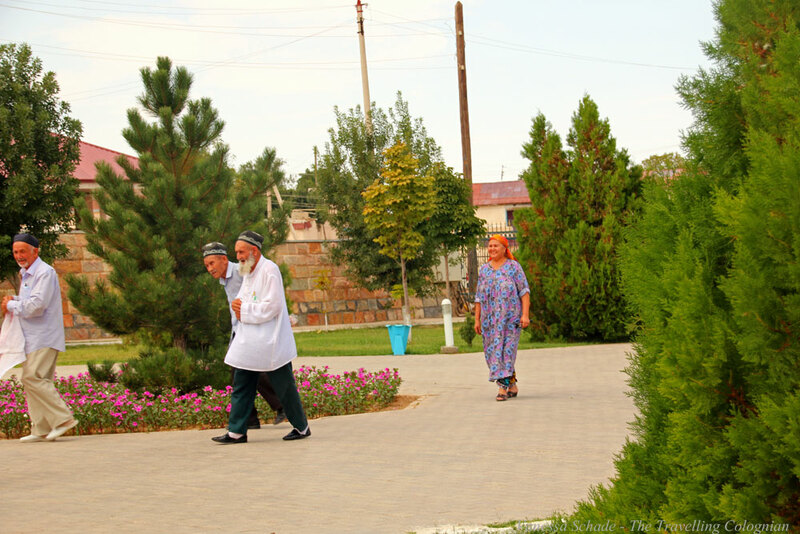 Would you like to read more about Uzbekistan? 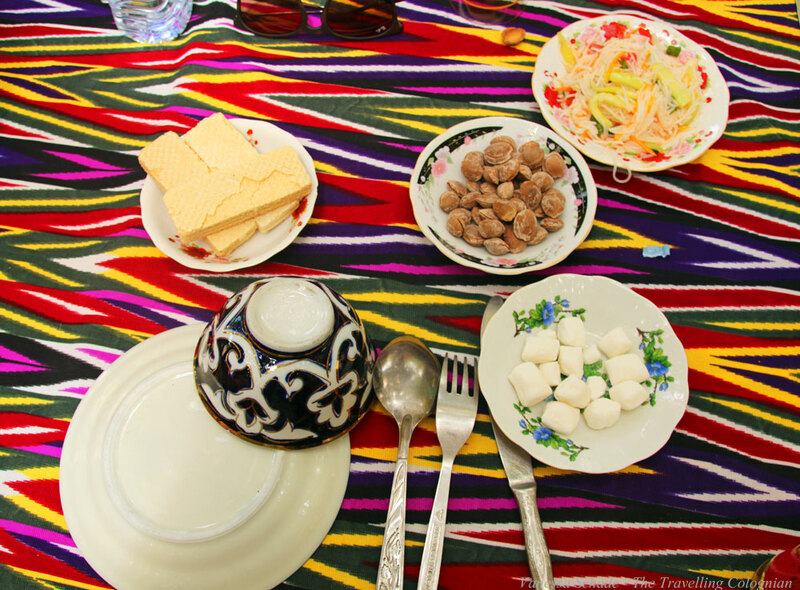 In this blog post, which I published before travelling to the country in July 2016, you can read about other travel bloggers tips for Uzbekistan. Moreover, I have published blog articles about the highlights of Tashkent and the main attractions of Samarkand. Would you like to be informed as soon as I publish new blog articles? Then subscribe to my RSS Feed. I would also be happy about comments on this article, and if you follow me on Facebook, Twitter, Instagram and Google+. Note: I have completely paid for my trip through Uzbekistan by myself. There were no cooperations. *All links which are marked with a star* are affiliate links. That means that I get a small commission if you book a hotel or a tour through one of those links – of course at no extra cost for you. Affiliate links help me to cover a part of the costs for running this website – so thanks a million in advance. When you are a returning traveller of G Adventures you even get your five percent discount in case you filled out the online evaluation form within a month after your previous tour. 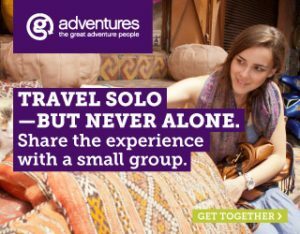 After booking just send G Adventures an email or give them a call and claim your discount if it doesn’t appear on your bill automatically. Being an affiliate doesn’t affect my opinion in any way. I only recommend companies and products which I personally use and love. All links which are not marked with a star* are no affiliate links. When I think of Uzbekistan, usually four cities come up to my mind: Tashkent, Samarkand, Bukhara, and Khiva. This post of yours is a reminder that there are still so many other places to explore in this fascinating country. Hopefully I can retrace your steps sooner than later. ‘Nice one Vanessa. ‘Loving the photography! Victoria@TheBritishBerliner recently posted…Summer Loving & my travel plans for the rest of the year! I am a writer and photographer from Cologne in Germany. Travelling, writing and photography are my passions. I love good talks with interesting people from all over the world, cooking and authentic really Asian spicy food. Copyright 2012 – 2019 The Travelling Colognian by Vanessa Schade. All rights reserved. Website content and photos are the property of this site’s owner, Vanessa Schade unless otherwise stated. Unauthorized use and/or duplication of this material without written permission is strictly prohibited.